He loved his drinks, sometime rum, sometimes beer, sometimes wine but Whiskey that was always. He always drank whiskey for sure. He drank daily sometimes moderate pegs sometimes over the limit when he lost control of himself. And he hated him afterwards. He loved whiskey but didn't like the person he became after drinking it but he couldn't help it. Slowly he started drinking more and more, he would be drunk all the time, he reached office drunk and was warned thrice but then was fired. Somehow he was unable to stop his downfall brought on by his love for his Whiskeys. Now since the income dried up he couldn't afford the foreign whiskey so he started buying cheap local ones. Now he wasn't drinking for love he was drinking to escape his reality. His wife left him, his family disowned him. But he didn't care as he was still getting his whiskey, his one last love. He would go to different parts of the city where he could get cheaper liquor. One day he reached a seedy bar in a slum which was offering their local liquor dirt cheap and he and others drank it but bucket loads. Next day he and 25 others were found dead outside the slum as the liquor they used was poisoned. His love for whiskey, wine, rum, bear, liquor took him to his path of death. 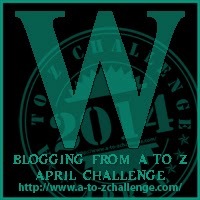 Entry for Blogging from A to Z April Challenge 2014 - Letter W.